The current version is very beautiful, I have to give props to The Idiot for his attention to detail. I'm quite astonished how so much work has been put in these last few years. 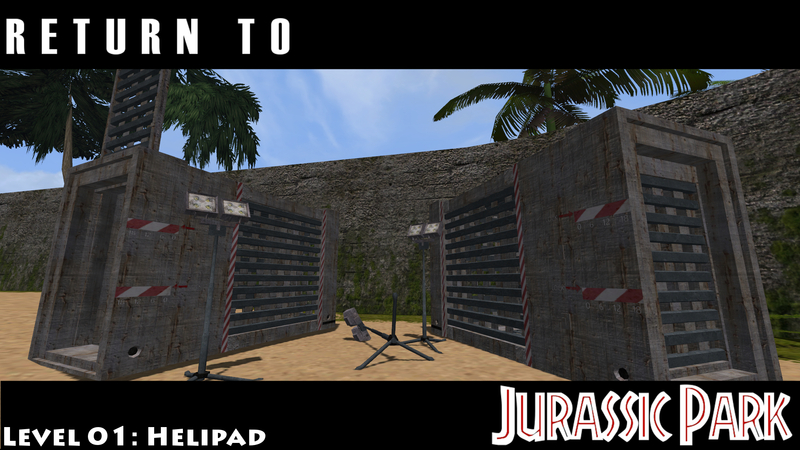 I think we may be getting the full Jurassic Park experience any person would want, a fully explorable Isla Nublar. Thanks, Krit! Even if you're not around much these days, you're still on the credits list. Technically it's going to be about 85% explorable, there are a couple of regions of the island which eventually had to get cut in order to get the story working without too much empty space - mostly just the south-western corner of the island behind the central mountains, but really there isn't much back there so it's not a major loss. In any case the 9 levels cover basically the whole island, including all of the interesting locations. Random good news: in a sudden burst of Trespassing, I managed to fill in almost the entire central part of the level and have nearly finished its southern end! The northern end is still heavily WIP, but I'd say the level itself is now about 65-70% finished (that's not counting all the gameplay-related stuff - triggers, enemies, that sort of thing). Still, quite the breakthrough, and the level is actually at last beginning to shape up in a form which I am 100% satisfied with. There's still a lot of work to do, mostly in the modelling department, but it's such a motivator to be able to look out across the island and see the level stretched out before you, waiting to be filled-in with puzzles and triggers and doodads. Ultiamately, I'm very glad to have broken the mod into levels as right now this is only like 30% of the island actually covered in actual explorable detail. It helps that I can simply port objects from this level as needed into later levels, sparing me all of the work of re-building all this stuff from scratch. Anyway, just wanted to share this bit of news with you all! There are definitely some locales which will be getting screenshots in the future, so fingers crossed - this level might actually get finished! And, since almost every other level uses at least part of the locations covered in this level, I strongly doubt that those levels will take as long as this one has to get finished. Ah, last note - there is now an 11th level to be included in the mod. It's not a huge level, so don't worry too much - it won't take long at all to finish. I should elaborate that only 7 levels actually take place on Isla Nublar (these are the levels which will get their own development threads as with Helipad), while the other 4 are more like cutscenes and story moments in level-form. Last edited by Draconisaurus on Thu Aug 30, 2018 6:30 am, edited 1 time in total. At last, after three seperate versions, Diane Forman - the character you will spend most of the game playing as - has been finalized! She's quite detailed but is still only 2200 faces (previous versions were 3000-4000, for comparison). 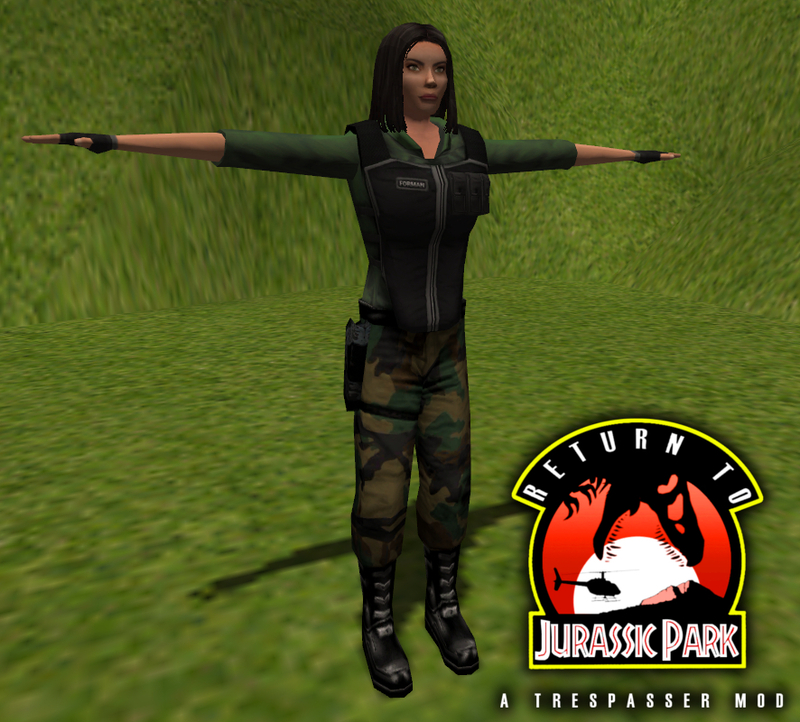 Her full body was created so that she can be seen in any third-person sequences we come up with! Still have a couple of things to touch up, but she is pretty much finished and ready for rigging! Changes from the previous version are essentially limited to giving her back her original short haircut, green eyes, and removing the kneepads (which may or may not see a return). Still gotta swap out the boots for the Trespasser ones. Nooice. Am unclear if the camera can be animated to leave the player model and return for cutscenes.. The transport of prehistoric specimens is handled through tranquilization and quick, safe wrangling and containment by Jurassic Park Animal Control staff. The smallest specimens can be transported using specially-designed carrier crates, while the larger animals are typically loaded onto one of InGen's custom-modified reinforced flatbed trucks. In order to avoid disturbing the animals or flow of traffic throughout the Park, transit of dinosuars and other hazardous material is done via the underground tunnel network which criss-crosses the entire island. It's been a while, so here are the completed Raptor crates in all their glory. Well, I've been modding all day straight and got quite a bit of work done, so I just wanted to post a little status update on the level overall. As of right now, there is only one area of the level which hasn't been built up in some way or another, but everywhere else is either done or halfway there. You can at last travel all the way from the start to the end without entering an area without detail! What this means is that Helipad is actually beginning to feel complete at last...level wise, at least - there are still triggers to write, puzzles to script, and dialogue to record. There aren't very many models left to make, though the ones that are left are mostly major locations (some of which hppav sadly worked on but never released ). Just guessing at this point, my prediction is that Helipad on its own will provide around 2ish hours of gameplay, and that's not counting the three prologue levels, either, which will come as part of the same release. -Visitors Center, finishing from hppav's model and the work I have done on it. -Main Utility Shed/Emergency Bunker. These buildings shared an interior set during production and therefore only require some modifications between the two to differentiate them. Recall that machf gave us a couple cars in that one test level. For accuracy modelling, I'm afraid I have to say almost definitely not, simple 'cause that is a bit too stressful for me at this time. I might be interested in rigging some creatures tho. Anyone else up for some modelling? for you, as well as some other tidbits. I can also handle script, dialogue recording if you wish. Last edited by TheKritter71 on Sun Sep 30, 2018 4:00 pm, edited 2 times in total.